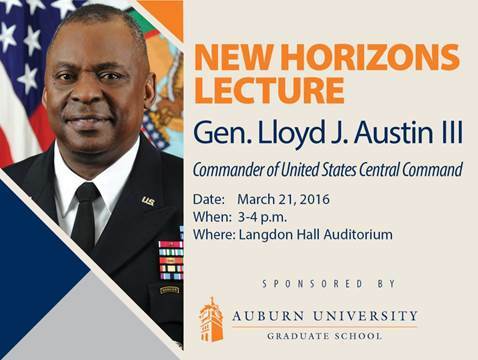 Army Gen. Lloyd J. Austin III, commander of U.S. Central Command and an Auburn University graduate, will deliver the Graduate School’s New Horizons Lecture on Monday, March 21, at 3 p.m. in the Langdon Hall Auditorium. The event is free and open to the public. Austin’s lecture will highlight his rise from small-town Thomasville, Georgia, to a decorated 41-year military career and one of the most prestigious positions in the U.S. military. Austin was commissioned as an Infantry second lieutenant in 1975 upon graduating from the U.S. Military Academy. Over the decades, he has risen through the ranks and broken down barriers. After confirmation from the U.S. Senate in 2010, Austin became the Army’s 200th four-star general and sixth African-American Army four-star general. He was the first African American general officer to command a U.S. Army Division (10th Mountain Division/CJTF-180) and a Corps (18th Airborne Corps/Multi-National Corps-Iraq) in combat. He was also the first African-American general officer to command an entire theater of war (United States Forces-Iraq) and to serve as Vice Chief of Staff, Army. In 2013, he became the first African-American commander of U.S. Central Command. Austin earned a Bachelor of Science degree from the U.S. Military Academy and he also holds master’s degrees in counselor education from Auburn and in business management from Webster University. His wife, Charlene, is also a graduate of Auburn University. Now in its eighth year, the New Horizons Lecture is sponsored annually by the Auburn University Graduate School. The lecture series aims to promote the exchange of ideas among students, faculty and the greater Auburn community through interaction with engaging speakers whose ideas and deeds have inspired others.